If you like salsa or guacamole you are going to love this! This is a salsa that is a little more filling then most. It is colorful and fun and if you enjoy good food this tastes great! Use: 1 small packet of "Good Seasons Italian dressing" mix. 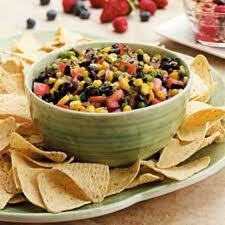 Make the dressing as it says on the packet and mix in with the rest of the salsa. It is great with or without the dressing! Also, if you haven't heard burlap is in this holiday season! You can go pick a half a yard up at Hobby Lobby, Joann's or any craft store for just a dollar or two and make a lot of fun things with it. And they have dark and light colors - choose whichever you like. Here are some fun ideas to make with burlap!